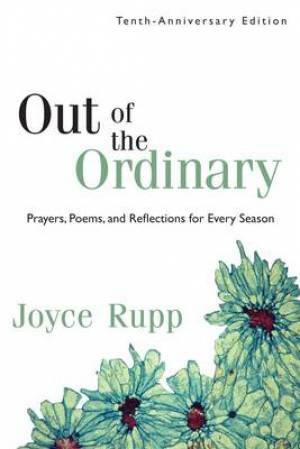 Joyce Rupps characteristic creativity and reverence for the Divine are on full display in this collection of prayer resources for birthdays, holidays, holy days, transitions, and many other occasions, helping readers enter more deeply and reflectively into the liturgical and seasonal celebrations of their lives. Ideal for personal use, or as a gift for loved ones celebrating a landmark occasion, this enduring spiritual classic is an invaluable resource for ministers, spiritual directors, and lay leaders alike, who turn to its prayers, reflections, and rituals for personal and communal occasions both ordinary and profound. Out of the Ordinary by Joyce Rupp was published by Ave Maria Press in January 2011 and is our 21573rd best seller. The ISBN for Out of the Ordinary is 9781594712203. Be the first to review Out of the Ordinary! Got a question? No problem! Just click here to ask us about Out of the Ordinary.